For some this will have been part of the strategy from day one, or the opportunity may have arisen from early growth at home. For others, the decision may be influenced by external investment partners — it’s common for firms to start talking to us when they’ve reached series A funding stage. One thing that’s common to all is that international expansion can be exhilarating, exciting, and terrifying in equal measure. Amongst the plethora of commercial, product, and marketing aspects to consider sits localisation. You know, that mysterious term that many people use interchangeably with ‘translation’. When do I need to think about localisation? Quite simply, it’s rarely too early. The specific timing will depend on your business of course, but many bumps in the road can be avoided by choosing a localisation partner early, and engaging with them deeply. Choose the right partner, and the process will be a whole lot smoother and you’ll benefit from their experience of working with companies at a similar stage of development as yours. At a functional level, you should really be thinking about localisation from the moment you even think you might want to look outside your own domestic market. For example, if you develop software, your engineers will need to take steps to internationalise your product before it can be localised. Internationalisation is the design and development of your product so that it can be localised and translated effectively further down the line. This usually means ensuring that your core build can support different currencies, date and time formats, right to left text direction, and other international elements. Leaving lots of space in the user interface (UI) for text expansion in different languages can reduce costs and headaches further down the line. To get back to the original question — if you’re reading this you’re clearly thinking about localisation (well done!) and now is probably the right time to take the next step. This will depend heavily on the nature of your business and your budget. Certain elements are a given. To succeed in a market where English isn’t the primary functional language, any elements that will impact directly on uptake or use will need to be localised. For software businesses, this will usually include the UI and any critical help files and resources. Where a physical product is involved there may be further packaging and documentation considerations. Web assets and marketing materials are usually closely allied to the product localisation and will often be included in the project from the first stage. This might also include channel-support and sales material, depending on your business model. At a more granular level, you may choose to have specific web assets like video fully localised and re-shot, or it may be more cost-effective to take the more common approach of adding in-language subtitles to existing assets. It’s important to consider all the key functional elements of your business that localisation will ‘touch’. Key executives with oversight of the product, marketing, technical, and engineering will all play a role in most cases. It helps if one person can take ownership of the relationship with your localisation partner, even if everyone liaises with them on a day-to-day basis. 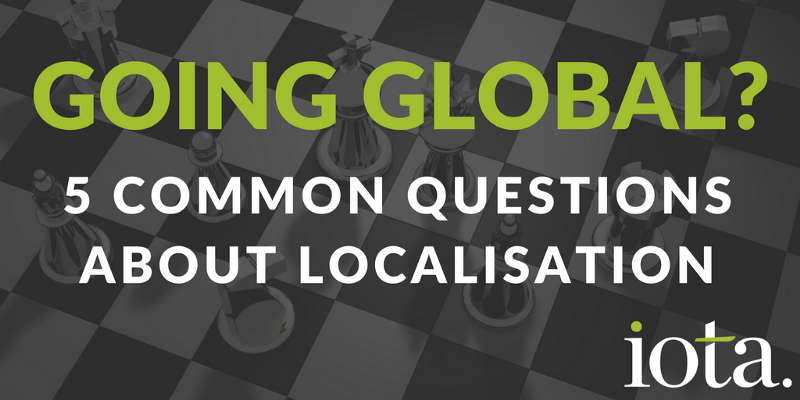 Talking about your localisation partner, who should be involved from their end? You should have a defined ‘go-to’ contact from the first time you contact them, but you should also have full access to the project team working with you and a defined feedback loop to in-country resources and linguists. If your prospective partner tries to force every interaction through a junior ‘account handler’ who doesn’t really understand what you’re trying to achieve — walk away. I’m targeting 6 countries and core languages, should I do them all together? Even if you’re planning to simultaneously ship new releases and updates in the future it can make sense to focus on just one or two languages initially. However, if your localisation strategy is investor or demand-driven you may be working to a timescale that dictates that they need to be completed at the same time. For experienced localisation providers like Iota, working on a range of languages concurrently is perfectly normal and won’t present a problem. Costs will vary considerably between projects. You should probably be wary of any potential partner who is quick to fire out a quote without fully understanding what you’re trying to achieve. In order to produce an initial estimate, your provider will need to see any original source files and documentation and analyse them in detail. A credible partner will be looking much deeper than the number of words for translation and will consider the complexity, subject matter, your wider localisation strategy, and much more when discussing the project with you in the early stages. In general, costs will be broken down into various elements, which will probably include the core translation rates per language, project management and engineering. Certain costs will reduce over time. For example, most localisation providers will use translation memory tools to store your previously translated text in each language. When an update or new release is due, the source content is analysed to see which elements are common to earlier translations and don’t need to be charged as ‘brand-new’ content. Given the strategic and commercial importance of an international launch, it’s wise to look beyond the numbers when choosing which provider to work with. ‘Fit’ is crucially important and can have a big impact on your success. Also consider the intangible elements that might be important to you like support and consultancy. Some providers will be happy to share their experience and expertise with you as a matter of course, whilst others might expect you to pay additional consultancy fees for anything beyond the functional tasks they’ve quoted you for. These are just some of the most common questions we hear. If you have any questions of your own, get in touch or leave a comment below and we’ll be happy to help.